On Friday night, in one of Paris's notorious all-night hang-outs, the Café Etincelle, activists from around the globe met up and began sharing ideas. This was also an opportunity to reach out to the general public and allow them the chance to talk with "the specialists". As the activists were having a drink together, just across the Seine river, at the restaurant Le Procope, Cynthia McKinney was having dinner in the company of the activist-sponsors who made generous donations in order to have a seat at the table (and defray the costs of organizing Vers La Vérité). Le Procope is the oldest restaurant in Paris and was where many great minds gathered to discuss important issues of the day. Benjamin Franklin worked on the US Constitution there. It was truly a special moment to be walking, or rather, "sitting, dining and discussing in their footsteps". It as history in the making. At noon on Saturday, they started with a healthy and delicious organic brunch in the Olive Grove at La Bellevilloise. The atmosphere was light and friendly, and everyone was even treated to a brief, but beautiful, impromptu piano performance by talented activist Patrick from the UK. Brunch was followed by the private Strategy session that allowed everyone a chance to focus on how best to move forward as a movement. Saturday evening was the main event: 4 exemplary individuals with complementary experiences all on the same stage to help the public begin to understand the complexity of 9/11. Debora was the host of the evening, introducing the guests and trying to keep the program on schedule. When the videos come out, you may want to watch it in slow motion! First up was Annie Machon who briefly told the public about her work as a counter-terrorism officer for MI5 in London. This allowed people to hear firsthand that governments do indeed orchestrate illegal actions and cover them up. Next, to introduce Cynthia McKinney, Debora had edited and subtitled a special 17-minute version of American Blackout so the public could see how the Bush administration openly colluded with private firms to steal the election that would ultimately put GWB in the White House and manipulate the one that would later take Cynthia McKinney out of Congress. 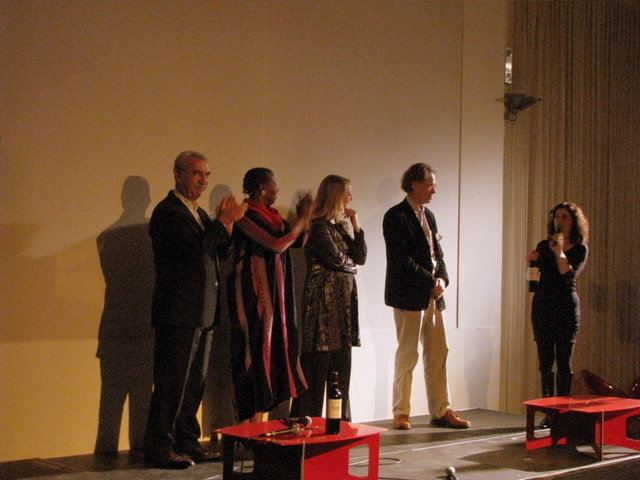 Following the film, on stage, Cynthia made a speech inspired by the breaking news announcement of President Obama's being the winner of the Nobel Peace Prize. She very astutely mentioned how ironic it was that at the same time, his administration was announcing the deployment of between 10,000 and 60,000 new troops to Afghanistan along with the announcement of the imminent availability of a new generation of bunker buster bombs which can be fitted with nuclear tips. Due to time constraints, Cynthia tool 3 questions from the audience and then Giulietto Chiesa took the stage. Recently back from a trip to Siberia, he broke the sad news to the audience that, over the past few years, Siberia has witnessed the formation of "lakes the size of France", and that diminishing resources will ultimately lead to a horrendous battle of survival of the fittest if we don't start changing our way of life immediately. They then showed ZERO and brought the other face of the 9/11 issue to the public's attention. Since the evening’s focus was on many disturbing issues, 9/11 being at the core, the public was not necessarily aware of the numerous inconsistencies in the official government version of the facts. Now they are. Following some quick Q&A with Giulietto, Niels Harrit helped the audience understand the importance of his research and findings, namely the discovery of unexploded nano-thermite in the World Trade Center dust. To add a little levity to the evening, we auctioned off a dvd of the documentary, American Blackout, along with a special copy of Global Outlook with Cynthia McKinney on the cover and the highest bidder turned out to be Mathieu Kassovitz, one of France's most famous actors and film directors. To those who thought or assumed it was planned, it was not! Mathieu has recently spoken publicly on live national television in France that the official 9/11 narrative if rife with problems. He has rapidly become one of our biggest advocates. To close out the evening, Debora showed a special 10-minute montage, a sort of "best of" French comic Jean-Marie Bigard's 9/11 video clips that she put together and subtitled into English especially for the occasion. Everyone had a good laugh and when the lights came back up, people had a hard time leaving the room, which was just as packed at the beginning as it was at the end. Proof that the night was a big success. Sunday morning, about 50 activists assembled at Place de la République for Paris's first 9/11 Truth demonstration. As the group waited for others to gather, Debora decided to bring a flyer over to two police escorts and gave them a crash course on what's wrong with the official report. As the two plain clothes officers learned about each new anomaly, their faces revealed shock and surprise, and their words left no doubt. They quickly agreed that something is very wrong. When they asked about Bin Laden, Giulietto Chiesa was just arriving for the march. So Debora brought him over and he briefly explained to the police officers what was wrong with the Bin Laden videos. The group left Place de la République, and began to walk to Place de la Bastille. Debora led the procession carrying a 9/11 Truth Now sign that Diana brought from Spain and attached to a tree branch she found on the ground. As they walked, they shouted "11 Septembre, coup monté! Nous voulons la vérité! 11 Septembre coup monté! Nous savons que vous mentez!" That means "9/11 inside job! We want the truth! 9/11 inside job! We know you're lying!" As the group moved down the boulevard, our escorts stopped traffic at green lights so we could cross the street. How great to see Truthers getting the royal treatment! By the time they reached Bastille, our escorts had asked some activists in the group if they had any extras dvds. They did and graciously gave a few to the police officers. As the demo came to a close 2 hours later, the officers told Debora everything went perfectly and that they would file a positive report so that if, in the future, we want to organize another demonstration, there will be no problem. That was a beautiful moment as well. Overall there was some press coverage, such as Libération, TéléLibre and Turkish Times. Cynthia also gave interviews with representatives from Amnesty International and Nexus magazine. Mainstream tv station M6 was on hand Saturday night gathering information for "60 Minutes" type program they're working on. All in all, it was a remarkable weekend. Activists from Austria, Belgium, Canada, Denmark, France, Germany, Italy, The Netherlands, Spain, Switzerland, Turkey and the UK and the US were on hand. Cynthia McKinney was fabulous, captivating people wherever she went. Giulietto, Niels and Annie were all wonderful, too. It was truly an honour to have these remarkable individuals at Vers La Vérité. Douglas Hilton on Tue, 10/13/2009 - 8:19pm. The 60s Peace Movements, and their hapless-naive-egocentric leaders, never were able to "get" that they were being "hacked" on a daily basis...ALTHOUGH...some announced such...yet bent over and continued their naivite' anyway. We also know that we do not need the approval of, the interaction with, the support of...Farrakan...to be comfortable with our journey. Robin Hordon on Tue, 10/13/2009 - 9:15pm. I've been thinking much the same thing about this sudden and unprecedented (as far as I know) upsurge in posted videos to this site pertaining to Farrakhan. I don't know much about search engines; but one thing I know is that numbers matter--so we suddenly start seeing a bunch of these videos in one thread after another, of no apparent relevance to the topic at hand (the occasional off-topic comment that occurs on this site is one thing; but this is something we've now been seeing over, and over, and over....); more posts, more clicks from curious visitors to the site each time it appears, and the next thing you know, a search for '9/11blogger' and 'F******han' generates a significant number of hits--many more than would have been the case even a week ago. And our foes would then have another means to tag the 9/11 truth movement in a way that isn't really representative of us, but may work all the same in dissuading at least some people from listening to us. And now it seems, they're trying (and may succeed) in more closely associating the name of 'Kucinich' with the aforementioned figure as well. rm on Tue, 10/13/2009 - 9:56pm. Who is this 'we' you speak of? You're a grown man (who supposedly dislikes leaders), speak for yourself. Your stream of conciousness, insinuation fueled tirades do not interest me. At least Doug wastes my time with more amusing grammar. influence device on Wed, 10/14/2009 - 7:38pm. Please continue to be amused by this fellow who is connecting Farrakhan to the 9/11TM...on some other site...in some other world. I'm not amused by your friend's humor...and I suspect that whatever they-you-we-me define as being we...don't find it amusing either. Which you are finding out as you read this! Robin Hordon on Thu, 10/15/2009 - 12:09am. I think I'm beginning to understand. You believe the '60s Peace Movement' failed because they didn't recognise subversive elements, and you consider Doug (who I do not know or endorse) to be an agent of some kind. Freely associating, Jones and Tarpley come to your mind. You consider them 'leaders', which makes you suspicious of their motives, and so you are attacking them in good faith. Safe to say, I am not so sure about any of this (and quite possibly through ignorance). But I don't believe attacking members of the movement is the way forward. Does it not seem at all subversive to you? I'm still very interested to hear what you think about my post (re:Kennebunkport) in the WACLA thread. I am genuinely curious and don't seem to be able to get a reply from anyone. Anyway thanks for your response, it's not like I don't find plenty to agree with / think about in many of your posts. influence device on Thu, 10/15/2009 - 11:16am. no_body on Wed, 10/14/2009 - 7:41am. truthoverprofit on Wed, 10/14/2009 - 4:49am. Thank you organizers for this fantastic event!! Cynthia McKinney is heartfelt, thoughtful, and spot-on as usual. If only she were our president!! "There comes a time when silence is betrayal." - Rev. Martin Luther King, Jr. Reverse Engineer on Wed, 10/14/2009 - 1:55pm. This is not the first time I've posted something here that was immediately spammed by a fellow blogger. I find it appalling and can't help but see the irony in it. The behavior of these spam-posters is just plain childish at best, malicious and conniving at worst. I think it is safe to assume that the vast majority of people posting and reading here share a common motivation and opinion on 9/11. It is therefore highly unacceptable, not to mention curious and counter-productive, to spam each other and railroad each other's messages with off-topic and irrelevant banter. I would have hoped more people would have been pleased to hear about this major breakthrough event in Paris. Instead, this thread has become yet another place to bicker over someone's rude off-topic spam post. Sure, we have the power to "vote down" the spammer, but why should we have to in the first place? We all complain about how the MSM ignore us, how no one will listen to us, how hard it is to get through to otherwise intelligent people. How is it, then, that amongst ourselves right here on 911 Blogger, we have such individuals that can't even see that they themselves are not listening? That they themselves are diverting attention from the posted subject at hand? That they themselves are infringing on others rights to post and share information in a respectful manner? I'm a firm proponent of free speech. But only to the point that it doesn't infringe on mine. So, Douglas Hilton, I ask that you (a) grow up and learn some self-control and (b) renew your friendship with the "blog entry" button so that next time you want someone's opinion on something you consider important, you do so where you're supposed to, and not on my post, or anyone else's for that matter. milongal on Thu, 10/15/2009 - 4:32pm. Thanks for the excellent write up, and also for the audio link. I'm always disappointed when there's no 'play' arrow on the image, I could watch things like this all day. So I look forward to the videos, and am thankful such events are saved from the memory hole. I'm sorry for the bickering above and also posting a non relevant link. I had just witnessed the same phenomenon occuring on the current wacla anti-war thread, and that particular link seemed to gridlock the off-topic 'anti-Tarpley' chatter. Possibly through boredom. However, I *am* genuinely interested in people's thoughts on that, so I guess my motives are duplicitous. I will create a blog entry. If only Alanis would have covered this exact scenario. influence device on Fri, 10/16/2009 - 6:49am. mouv4x8 on Sat, 10/17/2009 - 6:08am. Thanks for the video. I consider catastrophic anthropogenic global warming to be one of the largest hoaxes of all time, right up there with 911. There are many similarities between the two 'truth' movements (not least that they are both current). Both oppose 'noble' lies that are derived from the world view of Machiavelli, Malthus, Strauss and the like. One myth is for the 'right', the other for the 'left'. Both opposing, reason based groups are called deniers, crazy, and worse. Both official stories involve closed-source simulations to 'prove' their hypothesis. I have heard it said that the official 911 story is like the Nazi's Reichstag fire. Elsewhere I have heard that the CAGW myth resembles eugenics (race science). Con-merchant Gore won the Nobel Peace Prize and so has the war-monger Obama. I'm not trying to convince anyone here that CAGW is false, so much as redress the balance of this thread. However it is a certain fact that if a fraction of the money spent on war (or reducing Carbon emmisions) was spent developing better technology (like nano), then all bets would be off. Spending some of that money on the poor would be a start. The future is hot and cold, vast and amazing; bearing this in mind it is silly to suggest that 'the energy' is running out 'forever' (as opposed to something like 'we're running out of the oil we're aware of', though I am not convinced of that either). Forever is a long time. I suppose that most have at least noticed the 'convenient' temporal juxtaposition of CAGW, Peak Oil, and the 'terror/resource wars'. Obviously I don't believe Giulietto Chiesa has malicious intent, and I think his 911 work is exceptional. I can't feel the same resentment towards those who believe in CAGW as I do towards those who defend state terrorism and war. But I don't know whether the consequences of society believing this 'big lie' will be any less dangerous, and the sociopathic puppet masters pulling the strings are the same. For those who aren't happy when 911 is declared 'explained' by the MSM, Hollywood, Politicians etc., spare a thought to those who (ok, who claim to) have explained why the hockey sticks are fraudulent, irrelevant, etc., many of whom feel that science itself is being usurped, tarnished and politicized. Again. Until something like this gets posted, it feels too rude to break the taboo, even just to point out parallels. Hooray for the big tent :) Hopefully, this forum contains readers who aren't flummoxed by how incredible I sound, and maybe even a few who agree. For those interested in critique, here's a recent essay by Richard Lindzen. Maybe we could all do with a bit more Popper, and a lot less Nietzsche. influence device on Sat, 10/17/2009 - 12:51pm. Merci and thanks to Debora and Annie , WeAreChange Holland and all the other participants for this remarkable evening and for the following "28th Onze Bouge" on Sunday the 11th October 2009; Manifestation from la place de la République to la Bastille. because of the poor lightning in the "La Bellevilloise" upstairs big room most people like me did not have good photos or bright videos. Howerver this photo gives an idea of the room and the number of people there. "Les grands mystères de l'histoire" Hors Série N°5 consacré aux attentats du 11 Septembre avec la Dvd Loose Change Final cut"
which came out in April 2009 and sold out so quickly that a lot of people could not obtain it. The new number °6 which came out the 14 of September 2009 is still available in the local newspaper shops. I encourage each French reading person to buy the two numbers which are so well done. Hoping that they will be translated into english. Some people were coming and going but we can say there was between 400 and 500 depending at which moment you did the count. I had some excellent interviiews but afterwards some technical problème corrupted my flash card and I lost all the footage of that night. My apoligies to the persons who gave me some of their time for nothing. However this important moment was caught on other video and I have put below the links that I had found ( if you find other please put add them here to the list). Both English and French viewers can retrieve something from these videos as they switch often from French / English / French. Annie Machon at the Vers La Vérité ,Paris 2009 Whistle blowing ! We Are Change Holland meets Truth activist Ian Henshull at the Vers La Vérité ,Paris. mouv4x8 on Sun, 10/18/2009 - 6:01am.